Dazu passt auch seine Auseinandersetzung mit den widersprüchlichen deutsch-deutschen Verhältnissen oder der Politik von Franz-Josef Strauss, bei seinem Auftritt zum Erhalt des Bayrischen Filmpreises 1981, der dann auch für einen gewissen Eklat sorgte. Über die Familie Brasch (sein Bruder war ebenfalls Schriftsteller, sein Vater stellvertretender Minister für Kultur der DDR) erscheint im Februar das Roman-Debüt "Ab jetzt ist Ruhe"von Marion Brasch, seiner Schwester die Ende der 80er DT64-Redakteurin wurde und heute bei Radio Eins moderiert. This documentary (in FR & DE) was on programme at 2011-03-22 | For copyright reasons Arte is obliged to take its videos off after about 2 weeks. Kander won the 2009 prix Pictet for these photographs. The award focuses on sustainability and climate change, and last year's theme was the Earth itself. The Yangtze "is a metaphor for constant change", as Kander puts it, and also a literal indicator of the destruction and devastation China is visiting on its land and its people as it ruthlessly pursues economic development on an unprecedented scale. It is the world's third-largest river and its banks are home to more people than live in the USA. Or, to put it another way, one in every 18 people on Earth lives along the Yangtze. "The river," writes Kander, "is embedded in the consciousness of the Chinese, even for those who live thousands of miles from it. It plays a significant role in the spiritual and physical life of the people." One Chinese man Kander befriended asked the question, "Why do we have to destroy to develop?" It is a question that reverberates through this haunting book, which is an already-historical record of a vanished or rapidly vanishing country. "Nothing is the same," Kander's friend told him. "We can't revisit where we came from because it no longer exists." • Nadav Kander: Yangtze - The Long River is on at Flowers East, London, until 13 November 2010. Don Hunstein was an in-house photographer for Columbia Records in the 1960s. 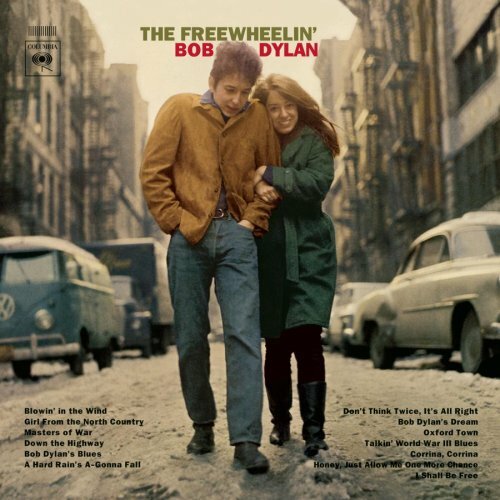 He was commissioned to shoot the cover of Bob Dylan's 1963 album The Freewheelin' Bob Dylan, a shot that has since become iconic. It freeze-frames Dylan and his then-girlfriend, Suze Rotolo, on the corner of Jones Street and West 4th Street in Greenwich Village on a wintry New York day. In her memoir, Rotolo noted: "It is one of those cultural markers that influenced the look of album covers because of its down-home spontaneity and sensibility." Hunstein also captured a more studiedly cool Dylan at work on the groundbreaking Highway 61 Revisited in 1965. Both sets of photographs are on display at Proud Chelsea until 21 November 2010.